Kilkenny Cat Laughs – 25 Years & Counting! I don’t remember much about the first Cat Laughs, Kilkenny, which grew out of a local theatre company called Bickerstaffe. I was mostly in a trance state with a CD of Moby’s Everything is Wrong thumping loudly on repeat in the John Street office. I remember smoking a lot, having arguments about whether to put ‘Ireland’ or the ‘Republic of Ireland’ on the contracts; the actor Frankie McCafferty paying for tickets with a credit card, which in 1995 struck me as the poshest thing imaginable and finding the brilliant Jeremy Hardy asleep in a hedge outside the Newpark Hotel. I remember Emo Philips sporting a bizarre 3-D monkey on a t-shirt which he wore religiously; Sean Hughes being the brightest Irish star by a mile and Jo Brand shocking her audience at the Watergate Theatre. And I remember being taken aback by the numbers on Parliament street swilling beer and blocking traffic on Friday night; I distractedly handed Woody Harrelson – over to support his mate George Wendt – a 14-page fax at the bar in The Kilford Arms (faxes were everything), oblivious to who he was; but mostly I remember comics at the back of gigs watching other comics and I remember that we sold very few tickets. It was a tad FyreFest-y, albeit with acts. I have infinitely more memories from the 1996 festival – sans Moby – probably because we used that festival to pay off the first one. There were other reasons too, most notably with Murphy’s coming on board as title sponsors; Kilkenny with the Smithwick’s brewery at its foot, was a ‘Guinness-product-only’ city at the time and publicans simply didn’t believe me when I made the announcement about Murphy’s. I remember sitting down with Eamon Langton in his bar. He looked at me straight in the eye as a mischievous smile crept over his face and leaning in conspiratorially, he chuckled: “there’ll be trouble ahead”. And boy was there trouble. The Guinness guys pulled out all the stops in an effort to muscle their way back – Murphy’s not overly concerning them, but Heineken worrying them a lot – but I was nervous about Cat Laughs being effectively owned by the national drink company and after all, a deal is a deal. 1996 was also significant because Bill Murray showed up to perform with his two brothers and basically put the festival on the international map. 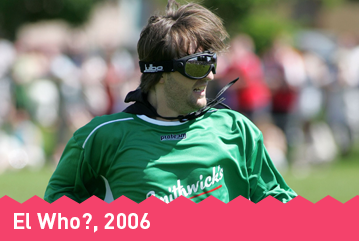 Word had got around that there was a comedy festival somewhere in Ireland which was fun to play and where there were no awards, reviews or TV recording (arguably the best set of decisions that we made from the outset). 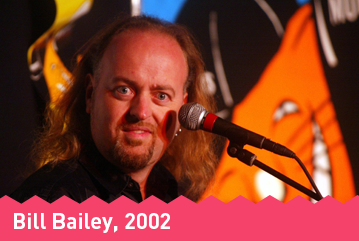 At this time, the only comedy festivals that seemed to matter were Montreal with short seven-minute TV-friendly sets, the Edinburgh Fringe with 50-60 minute sets and Melbourne with a similar format. At Cat Laughs, we basically asked three headline acts to share the 80 odd minutes between them with a host to link. It’s a format which really worked and still works today. There were some hour long shows of course (Johnny Vegas, Will Durst, Jo Brand, John Shuttleworth), but they were the exception rather than the rule. The bigger issue was which comedian would open and which would close. It’s almost hard to believe that in 1995 and 1996, no Irish comedian, apart from Sean Hughes, could close a set in Kilkenny. Punters in those early years paid to see UK and American acts. Scroll on 5 years later and you’d lose half of your crowd if the Irish comedian was done before the show finished. 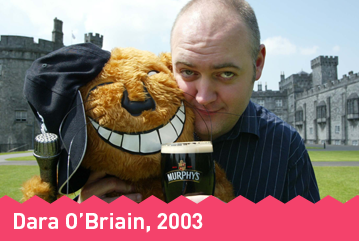 So, while the Cat Laughs may not have produced any Irish comedians, it undoubtedly provided the platform for Irish stand-ups to realise that they were as good as their American and British counterparts: the festival gave them huge confidence. To see comedians like Dylan Moran, Tommy Tiernan and Ardal O’Hanlon et al rip up the Edinburgh festival in the late 90s was incredibly exciting and I believe the festival had its part to play in that. In 1997, we had a load of tents as venues, which was a big mistake, but we also had Mitch Hedberg, which was glorious. 1998-2006 is blurry. I was still programming it, but I’d run out of steam and it was definitely time for a new face: enter Eddie Bannon. Eddie took the reins from 2006-2009, Rebecca Austin from 2010-2012, Naoise Nunn from 2013-2016. Now it’s Matt Smyth and Dan Colley at the helm. Consistently handing over the baton has undoubtedly helped to keep the festival fresh, alive and just about solvent, even through the tough recession period. I think this is because the Cat Laughs has always been a commercial proposition, run like an arts festival and audiences have really responded to this approach. 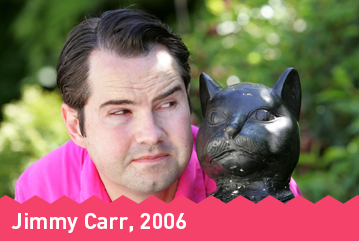 While there is no doubt that comedy festivals all over the world are utterly unrecognisable today from their original incarnation, that’s not the case with Cat Laughs. This presents its own set of challenges of course, but there’s a real merit to remaining obstinate, steadfast, singular; to continue placing stand-up comedy at the heart of a festival, which takes place in a bunch of sweaty rooms in Kilkenny. Kilkenny Cat Laughs is Ireland’s annual craic pilgrimage, and has been heralding the start of the summer season since 1995. 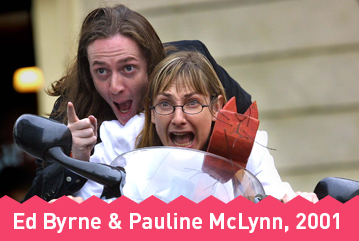 Now in it’s 25th edition, the festival has played host over the years to international and domestic world class comedy and is renowned for treating both talent and audience to a warm, welcoming and convivial atmosphere in Kilkenny, at the heart of Ireland’s Ancient East. Cat Laughs has a reputation for being the comedians’ comedy festival, and for creating an atmosphere where anything can happen. 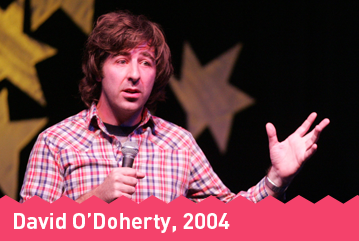 Over the years the festival has nurtured the fledgling careers of Irish acts like Dara Ó Briain, Aisling Bea, Graham Norton, Dylan Moran, Maeve Higgins, Ardal O’Hanlon, Joanne McNally, Deirdre O’Kane, David O’Doherty, Des Bishop and many, many more. 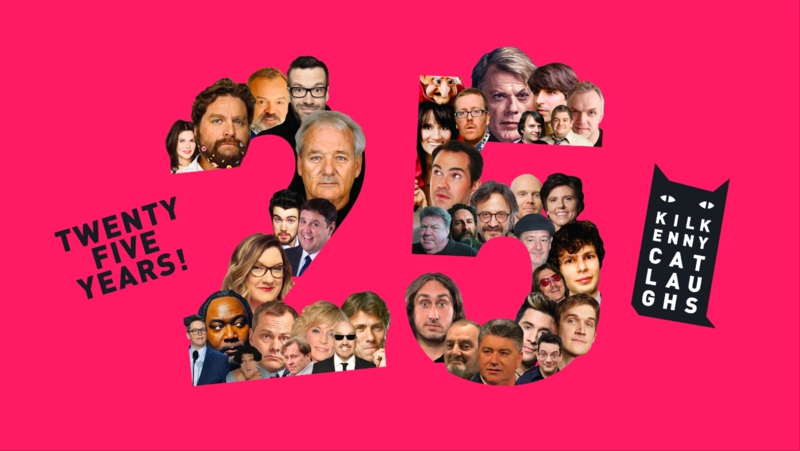 We have also welcomed international luminaries like Bill Murray, Zach Galifianakis, Laura Kightlinger, Bill Burr, George Wendt, Ross Noble, Peter Kay, Bill Bailey, Tig Notaro, Emo Philips and Sarah Millican among others. In 2017, Matt Smyth and Dan Colley of Collapsing Horse Theatre took over the reins as Artistic Directors, bringing some of their own comedy influences onboard and and building on the fine legacy of the festival. They took the helm again in 2018 and 2019 and look forward to combining the best in comedy standup with new names in the world of improv, sketch, podcasts and more. Roll on summer!